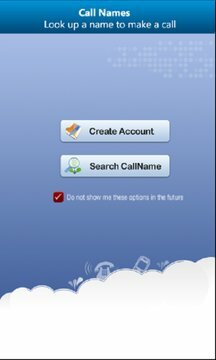 Call Names eliminates the need to remember phone numbers and connects people naturally through their easy to remember CallName. It allows you to associate a friendly name (CallName) with your phone number. Your friends and family will then be able to reach you by dialing your CallName using this application. Let your CallName tell your story. Pick up a CallName to express yourself , your favorite celebrity, your sports affiliation or your political orientation. Businesses can create a CallName that corresponds to their brand . Customers can reach them easily by calling their brand instead of a toll free numbers or a short code. Download the free app and register your CallName for free ! Share it with your friends and family, and experience a new way to connect with people. Look up a friend or a business. Then call them or send them a text message without a need to find their number. Call Names provides you a full control on your phone numbers. Next time you move to a new area code or change your phone numbers, you won't need to update all your contacts. Simply, login to your account and change your phone number, and people can still reach you using the same CallName!